TouchOSC, the popular IOS OSC control application, has been ported to Android. TouchOSC for Android is available now on the Android Market as donationware. This version basically represents the feature set that TouchOSC version 1.0 for the iPhone supported when it was first released. Minus the bugs of course. There’s a couple of reasons that led to the decision to release the application in this form. First of all, I didn’t want to make all of you wait any longer. Constructing a full port would have probably taken me another 12 months of trying to play catch-up with the original which is constantly improving. Secondly there seems to be an endless stream of new Android devices coming out every other moment, so testing the more advanced features on every possible configuration is basically impossible. Keeping it lean and simple will probably help in making it work for most of the available gadgets right now. All that said, I also decided to make the application available for free. There don’t seem to be a lot of (successful) paid applications available on the Android Market right now and from my research the general user-base is also not exactly used to actually pay for apps. The ad-supported model that a lot of developers go with is also something that I wouldn’t even consider at my most delirious. Call me crazy. This video, via mvpadrini, demonstrates how you can use the $2.99 app S1MidiTrigger on an iPad to add a touchscreen to your synthesizer. S1MidiTrigger is a new app for iOS which works with the Line 6 MIDI Mobilizer. You can create your own MIDI layouts using the layout menu and use the multi-touch interface to control any MIDI device. Here, S1MidiTrigger on the iPad is connected, via a MIDI Mobilizer to a Korg microX synthesizer. S1MidiTrigger é um novo app para iOS compatível com a interface MIDI Mobilizer da Line 6. Com ele é possível criar layouts MIDI personalizados no próprio aplicativo e utilizar a tela multi-touch para controlar qualquer equipamento MIDI. This is a quick demonstration of DroneStation, a new app for the iPhone/Touch. A 2-oscillator synth, with an unique multi-touch interface that will hopefully make it more playable than trying to peck away at a little keyboard. Screenshot showing it’s a 2-osc synth with a resonant 4PLP filter. Christian Bannister from Subcycle Labs has created a patch for visual multi-touch manipulation of a bass synth (Native Instruments Massive). 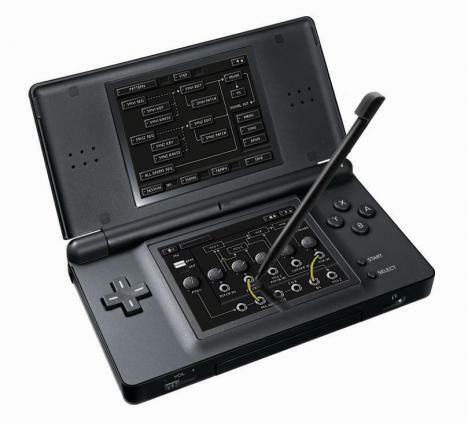 More than just a piece of software, KORG DS-10 lets you control a “four part drum module, two analog synth simulators, and 6-track/16-step sequencer” with your Nintendo DS’s touchscreen.